You’ll feed the cold water fish less than the warm water fish. 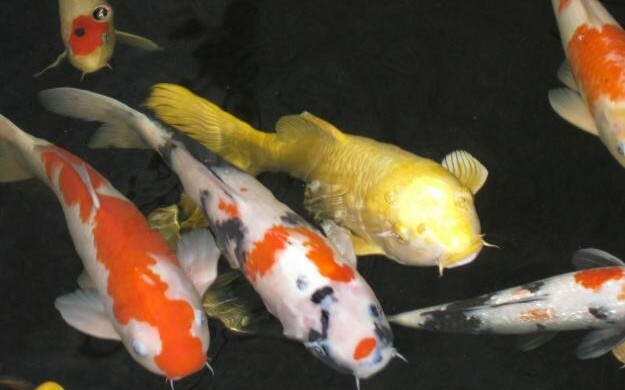 For this reason, you must maintain a schedule for feedings to make sure you’re not overfeeding your koi fish. How Old Are Your Koi Fish? Smaller, younger fish vs. larger, older fish? Smaller food items such as pellets or flakes are better suited for young fish, while chunks of foods will be more appropriate for older fish. Koi fish are omnivores, meaning they will eat both plant and animal materials, but they prosper on a vegetarian diet. Commercial, processed pet food should be the foundation of your fish’s diet. Make sure your purchase explicitly says koi fish food. Both young and old, your fish can benefit from occasional treats of wheat germ, lettuce, squash, and other assorted fruits and veggies. Once in a while you may want to feed your fish live treats like earthworms or prawns. Because Koi fish do not have stomachs and they cannot eat large amounts of food, spreading small meals throughout the day is optimal for the health of your fish in warmer waters. The temperature of your pond or aquarium will dictate the type of food and how often you feed your fish. 72-80 ºF – 3 to 4 times per day. The colder the water, the lower protein/high carbohydrate your fish’s diet will be. As water temperatures approach 60ºF or higher, your fish will require a higher protein/lower carbohydrate diet that includes more pellets. These Japanese carp are not your run of the mill pet, and what and when your fish will determine how beautiful and vibrant your fish are. Save yourself some effort and visit Motorcycle Pundit Sweeney Feeders for a premium, automatic Koi Cafe® garden fish feeder.